TripAdvisor will be rolling out a new service this fall for their Business Listing subscribers called TripAdvisor Connect. It is essentially a CPC (cost per click) program in which lodging operators can sign up. It provides a “Show Prices” button on the Trip Advisor Business Listing page that forwards potential guests directly to their branded website. Currently, Business Listing subscribers may only add a phone number and web address for contact information. This appears at the top of their listing in small non-descript formatting next to a small computer icon. In the past, the large and attention getting TripAdvisor “Show Prices” buttons have been linked directly to hotel chains and OTAs, like Expedia and Hotels.com. It is speculated and the FAQ suggests that they will roll out an extension of this same program with TripAdvisor Connect, but keep in mind that it could be quite different. If it is, we’ll cover the update on this blog as well. Could Trip Advisor Connect work for your property? Careful what you wish for is one of my favorite sayings. A year or so ago, I asked one of my TripAdvisor contacts why hotels couldn’t have a button on their TripAdvisor page like the ones that Expedia had. They told me that it just wasn’t feasible. That it was way too complex of an idea. Well, I guess they’ve found a way to make it work though not exactly how I envisioned it. In theory, their new program will have hoteliers essentially competing against the OTAs for sales of their own hotel rooms. Once the ‘new program’ smell is gone, I think lodging owners will find it is really pretty stinky. 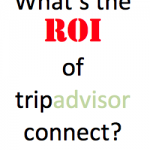 According to TripAdvisor, the prerequisites for TripAdvisor Connect are: a website integrated to an Internet Booking Engine, a TripAdvisor verified-account, TripAdvisor Business Listing subscription and a good-sized budget for the CPC campaign (Connect) itself. Today, hotel and lodging websites that allow potential guests to book directly online are becoming a standard part of any lodging marketing mix, but the ROI of TripAdvisor Business Listings, starting at about $1000 annually, has long been debated by lodging professionals and advisors. The logic of spending an even larger amount of money on a CPC campaign to attract potential guests that you’re likely to get anyway, even if through OTAs, is questionable. Why not use those marketing monies to attract guests that would not find you otherwise? Like a CPC campaign on Google, for example, that reaches into specific markets that match your property demographic? On the up-side, leads from the TripAdvisor Business Listing are considered conversion-ready. These are from Internet users that are ready to make a reservation. When a user lands on your TripAdvisor detail page, he or she will see your call-to-action button, click on the button and be moved to your website for direct booking. Sounds easy, right? The downside is that the direct link button will only appear when your bid meets the ‘minimum requirement’ for your property. What does that mean? It means that your ‘live’ direct link will only be shown if you are the highest bidder. You are essentially paying each time a person clicks on your link. If you don’t pay, the link goes to someone else like Expedia or Booking.com, who can afford to pay the price. I’m not sure many hoteliers will catch the fact that the direct link feature is not always there and those with deepest pockets will win. This is the first of a four-part series on Trip Advisor Connect brought to you by Social Energizer, Independent Hotel & Lodging Marketing and Operations Integration Advisors. There’s a lot to navigate in today’s online hotel and lodging world, let us help you plan your course!